The study also says that one crocodile has escaped from the facility in Hendry County, and survived in 1,012 hectare of semi-wild habitat for three to four years, confirming that this species can survive in southern Florida. “There are no signs of the crocodiles reproducing since arriving in Florida”, authors of the study says. It’s also unlikely the crocodile population has so far had any impact on native wildlife in the area. Nile crocodiles are the second largest reptiles on Earth, after the Saltwater crocodile. They can easily grow to 5.5 meters/18 feet (possibly up to 6 meters – 19.68 feet). The largest confirmed saltwater crocodile was a specimen named Lolong which was 6.17 meters/20 feet 3 inches. The Nile crocodile is an opportunistic apex predator and a very aggressive species of crocodile that is capable of taking almost any animal within its range. They are widely regarded as more aggressive and dangerous than alligators. Their jaws are also stronger than the alligators. It is one of the most dangerous species of crocodile: although most attacks do not get reported, the Nile crocodile is estimated to kill hundreds (possibly thousands) of people each year, which may be more than all other crocodilian species combined. 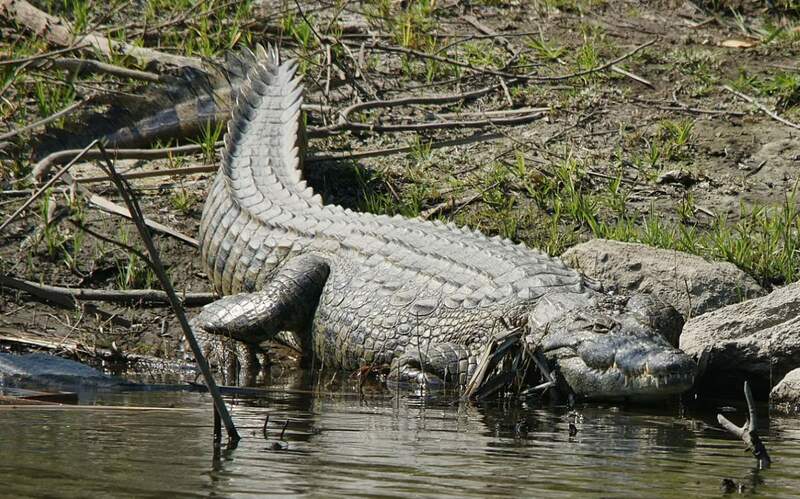 Read more: the differences between crocodiles and alligators. In 1972, I worked for the U.S. Fish & Wildlife Service (FWS) in Vero Beach, Florida. One day, responding to a call from the Florida Game and Freshwater Fish Commission, my supervisor, Joe Carroll, and I met two staff of the Commission at an estuarine lagoon a short way south of the State of Florida’s Mosquito Research Laboratory (now the Florida Medical Entomology Laboratory). One of the State personnel was Larry Shanks, who later worked for FWS; I do not recall the name of the other. The laboratory is about 3 miles south of Vero Beach and lies along the Indian River Lagoon. The State staff had been told that an especially large alligator had been seen in this area. When Joe and I and the State employees arrived at the site, all of us were astonished to see that the reptile of concern was a CROCODILE, and a large one. It was later measured at 12 feet. The crocodile was calmly resting at the surface about 50 feet from where we were standing and gave no sign that it had noticed our arrival. The State personnel arranged for the beast to be trapped and transported away from the area. it was taken to a location in the Florida Keys known as Lake Surprise and released. Portions of Lake Surprise lie within a wildlife management area near the north end of Key Largo. American crocodiles are present in that area. Several days after the crocodile was removed to its new location, one of the State employees called to advise that the crocodile had been determined to be a Nile Crocodile. I do not recall any details of how that determination was made. We speculated that the crocodile might have been an escape from a tourist attraction nearby, then known as McKee Jungle Gardens, now McKee Botanical Gardens. They formerly maintained captive animals of various species, including crocodiles. Wow, that was quite a story! Thanks for sharing, John!